The French centrist last week laid out a series of proposals for a European renaissance to fend off rising nationalism, but his call received a lukewarm response from other EU leaders. “We will get off to a bad start if she arrives saying ‘I am Mrs Nein’. This is not the spirit of the Franco-German relationship, it is not what the [Franco-German] engine should be like,” centrist lawmaker Richard Ferrand said. 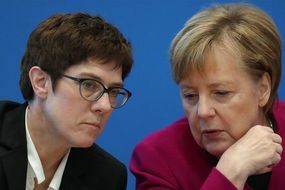 Mrs Kramp-Karrenbauer, the leader of Germany’s ruling Christian Democrats (CDU), is “challenging” the French President in a bid to find her feet on the German political stage, Mr Ferrand continued. “There is probably a positioning problem, a need to restate a number of the CDU’s positions,” he said. Mrs Merkel’s presumptive political heir offered a tepid response to Mr Macron’s EU proposals, angering the French leader’s allies. 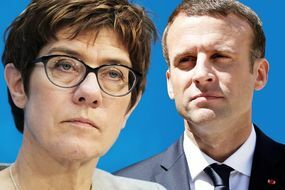 In an opinion piece published by the German weekly Welt am Sonntag called “Doing Europe Right,” Mrs Kramp-Karrenbauer echoed Mr Macron’s call for a reform of the bloc’s migration policy, but rejected his idea for a European minimum wage and warned against collective eurozone debts.